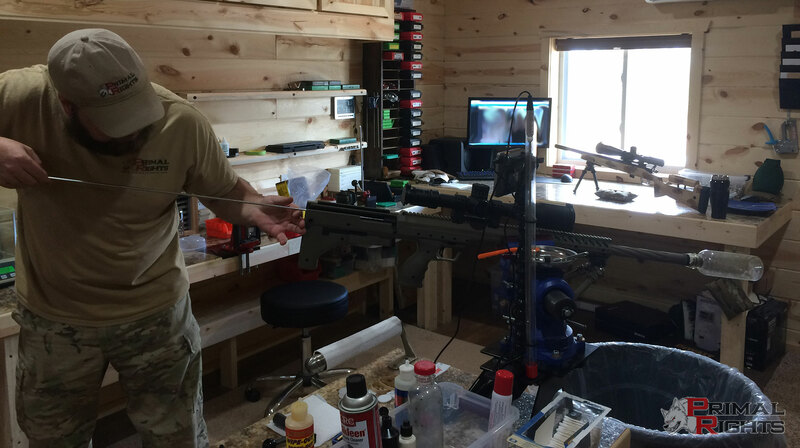 There are so many different methods, tools, and opinions on rifle barrel cleaning that it would be virtually impossible to even mention them all. Barrel cleaning is quite possibly one of the most argued topics in the precision rifle world. The only thing more impressive than the number of discussions that take place regarding this topic on a daily basis is the list of available cleaning solvents which all claim to be the best product in the world. While conversations regarding barrel cleaning are often divisive and heated, there is one thing that everyone can agree on: Everyone will need to clean their barrel at some point. My own experience with barrel cleaning covers a span of about 25 years. Cleaning my pellet rifle as a kid is where it all started. Graduated from there into rimfire and then into centerfire, just as most kids in the midwest. During that time I've probably employed over a hundred different cleaning products, several dozen brands of cleaning rods, and countless types of brushes, jags, and patches. Despite all of that, I still can't say for certain what the "best" is. Strangely I still don't feel as if I know for sure that I'm cleaning my barrels correctly. Usually when I've been doing something for so long I generally get a pretty good lock on whether it's going well or not fairly early on. Yet that kind of confidence remains elusive regarding barrel cleaning. If you ask 1,000 different people how to clean a rifle barrel you are likely to get 1,000 different answers, ALL claiming to be right. I'm not aware of a single topic in all of precision rifle shooting where such disparity of opinion exists. The reason why is fairly simple: There is a distinct lack of scientific evidence supporting one method or product over another. The reason so little concrete evidence exists regarding barrel cleaning is simply the fact that if you're doing it wrong, you won't always know immediately. You may not know if you're doing it right immediately either. It may take many cleaning cycles for a trend to appear, if one appears at all. By then, it's likely the barrel might be worn out anyway. With all the shooters out there, one would think that there would be so many data points to discuss that the solutions would be self-evident by now. Yet that is flawed logic for the simple fact that shooters tend to talk far more than they shoot. Most people won't shoot even 100 purposeful centerfire rifle rounds per month. Most will shoot significantly fewer than that. Compounding the problem is that even among active shooters, the practice of logging your round count and cleaning interval is not adhered to by many. This leaves only the very upper tier of elite shooters whom keep meticulous enough records which any conclusions could be drawn from, yet as with most things at the top tier, those folks aren't quick to advertise the secrets of their success without some financial gain. While this may seem like a very pessimistic view of the topic at hand, I feel it important that this article acknowledge the insurmountable task of getting people to agree upon one set of products or any particular methods as it pertains to barrel cleaning. I truly believe it will never happen. For every person that tells you that their way is what works, you'll have 10,000 lined up to tell you how that is stupid and you should do their way instead. I have no intention of trying to convince anyone of anything in this article. The fact of the matter is, if you aren't willing to try it and find out for yourself, then the information is useless anyway. The last thing I want you to do is read this article and then go spout off about how this is the best way to other people without even having tried it yourself. There's already too much of that going on. I'm going to use my time with you to talk about how I clean rifle barrels lately. I could re-write this article every single year and it would be different each time, because my methods and products used are always changing. I'm always trying new things in an effort to save time, save money, or increase precision in my cleaning regimen. I plan to spare you the pain of enduring the explanations of what I did in the past. Not enough room on this page for that. I also do not plan on providing a lot of "proof" that what I'm doing is working either. As I said, proof on this topic is hard to come by. My methods I'm employing now are working better than anything I've done before, but in a year or three I'll likely have new methods and solutions. If you want proof, you'll have to do the work and prove it for yourself! The choices I've made regarding equipment and cleaning agents are not to be viewed as an endorsement of those products in any way. Rather it is simply a list of what I happen to be using presently. I'm happy with the items I'm using right now, but as per the norm for Primal Rights, we will not endorse a product until it has completely proven itself. Given the fact that this topic is almost impossible to quantify as previously discussed, I can't give long standing product endorsements simply because it will take years of use and thousands of rounds before anything can be proven. So, if you'd like to try the products I've listed, please do so knowing that they seem to be working well for me at the moment and I like them better than what I've used in the past. Though continued use and further testing is required before I can rate their value unequivocally. There you can see my typical setup when cleaning. This has evolved over the years just as much as the rest of the process and it too continues to be improved upon. I clamp the rifle into my vise using some nice squishy soft jaws I picked up on brownells. Traditional rifles get clamped on the stock in the action area. The rifle is tilted downward a bit so things will naturally run out of the barrel with gravity. This allows me to keep the rifle held sturdy and I don't have to worry about the rifle moving around while I'm running the rod. Lots of advantages here compared to using some kind of "gun cradle" which sits atop a bench. Down a the muzzle end I have a bottle I customized by shoving a Desert Tech brake thread protector into the mouth. I screw the bottle onto the brake and viola the bottle keeps all the patches and mess from escaping. On rifles with other brakes I wrap a paper towel around the end of the barrel and then shove a different bottle over the top of it so the bottle is held securely in place over the muzzle. You'd be amazed at how much nasty stuff a bore brush can fling around your room! In the picture you see a Desert Tech SRS-A1 with a TS Customs 30" barrel being cleaned. Whether a DT or a traditional rifle, I always start my cleaning process by removing the bolt, cleaning it, and re-greasing it. It is then set aside until the bore and action have been cleaned. If you look around that picture you'll notice the station is setup for efficient workflow. Paper towels, patches, cleaning agents, and various other things close at hand, with a lyman bore scope to check my work as I go. I'm sure the spaces in which rifles get cleaned are as varied as the readers viewing this article right now, but this is how I have mine presently! Making sure you have a properly fitting bore guide is a pretty important step that you don't want to miss. The sinclair two piece rod guides are my favorite so far. You choose the rod guide body which best fits your chamber for a snug o-ring fit, and then you select the rod guide insert that most tightly fits your cleaning rod. Once the rod guide body is snugly seated in the action, I slide the rod guide insert over the cleaning rod and then screw on the jag or brush to be used afterward. This helps keep the rod guide insert in good condition by avoiding the chemicals and attachments as much as possible. Avoid dragging your brush through the rod guide insert especially. The first chemical I use in the bore is CLR. Travis Stevens at TS Customs turned me on to this product a few months back as something to try for cleaning my suppressor baffles. CLR is a household chemical which is generally used to clean toilets, showers, sinks, and other items. It's namesake would suggest it is very good at removing calcium, lime, and rust buildup. I've not used it in that capacity, but I'll tell you what it is absolutely amazing at removing: Carbon fouling!!! I push about 5 or so patches wet with CLR through the bore and a massive amount of carbon fouling will be removed. Next I put a VFG aggressive pellet soaked with CLR on the ProShot adapter and scrub the throat. The VFG pellet allows for a back-and-forth motion that allows you to really scrub it good. This demolishes a stubborn carbon ring in record time. To date I've found nothing which takes the carbon fouling out of the throat faster or easier. It takes 30 seconds for rimfires and centerfires with light fouling and no more than 5 minutes for stubborn centerfires with rough throats. The VFG pellet can be "tightened" while in the bore simply by rotating the shaft on the cleaning rod to screw the pellet on a bit more. I used to loathe attacking a carbon ring, but the combination of the aggressive VFG pellet and the CLR makes short work of the job. Below are some before and after images of the throat in a 22lr and a centerfire. While I wasn't super careful about ensuring the scope was in the exact same spot for each picture, it will give you some idea. CLR and an aggressive VFG pellet can do in 60 seconds what would take 60 minutes with my old solvents and methods. ... and it does it without having to use pastes that get stuck everywhere and make a mess. After scrubbing the throat and ensuring the carbon buildup has been adequately handled, I will generally make 2-3 passes down the full length of the bore with the VFG pellet before removing it. Then I'll put on a new VFG regular pellet soaked with wipe out accelerator and soak the bore good with it. I'll follow that up with a pellet soaked with wipe out patch out. Typically I'll let that soak for 10-20 minutes or so, and then push a patch wet with wipe out patch out. That patch typically comes out bright blue. If you haven't latched onto this already, black on the patch is typically carbon fouling while blue on the patch is typically copper fouling. The use of CLR breaks most of the carbon fouling down and strips it out. This leaves the copper fouling exposed and the wipe out patch out/accelerator combo eats that stuff like it's being paid to do it. I'll continue to push some wet patches until the blue subsides. This usually takes 5 or so patches. Next I go to a bronze brush and give it about a dozen passes. Then back on the patches wet with wipe out patch out. I'll repeat this as many times as necessary. Most often, one cycle is enough. Some very stubborn barrels may require several cycles however. This is where the borescope comes in handy. You can get in there and really see what effect your methods are having. After the bore is good and clean I will use a large caliber bore brush roughly the size of the chamber with a large patch wrapped around it to clean the chamber. There will be plenty of left over cleaning agents sitting in the bottom of the chamber, so it's important to get all that cleaned out and ensure your chamber is free of residue and debris. I'll follow this up with a few dry patches down the barrel. Next up is the muzzle end of the barrel. I typically run brake-attach suppressors and the brake tends to get a lot of baked on carbon which can be extremely difficult to remove. Well thanks to CLR, this job is considerably easier than it has been in the past. A handful of Q-tips and a little cup of CLR and that brake and crown will be glistening in no time. If I don't plan on shooting that rifle for a while, I'll put a squirt of Kroil on a patch and push that down the bore. This is just a preventative measure to provide a little corrosion resistance. It's not really necessary if I intend on shooting the rifle within the next month or so. Clearly your climate and location may demand other considerations. There's really nothing complex about this. Not for me anyhow. I'm an active shooter, so I'd rather spend my time shooting than cleaning... yet the more I shoot the more I must clean. I've spent considerable time and money testing out various cleaning equipment and methods over the years with the goal of making the process easier on me. This is as easy as I've ever had it. I don't despise cleaning as much as I once did. Back when I was getting started in precision rifles I was so afraid of making a mistake that I was slow to try new products and new methods. Now, my attitude is that "it's just a barrel" and if this one gets messed up I'll have a new one put on. Simple as that. I've read countless papers and forum posts about barrel cleaning. Everyone from barrel manufacturers, rifle companies, and individual shooters can be found weighing in on the topic. I used to think barrels were fairly fragile things. The way you hear the majority of people talk about some good shooting barrels, you'd think they were made of powdered unicorn horn or something. The truth is if you exercise a little common sense, you aren't going to damage your barrel during cleaning. While that is true, it is completely unnecessary to over clean your barrel. You don't need to take it down to bare metal every time. Nor do you want to let fouling build up so badly that you can no longer chamber a round because you aren't cleaning aggressively enough. (yup, I've seen that on customers barrels before) While you'll likely never get those black streaks on top of the rifling toward the throat or middle of the barrel out of there, you can certainly keep the bore in a serviceable state. There's a happy medium to be had and the only way you're going to find it is by keeping an accurate barrel log. Round count and cleaning interval being chief among the things you must track on your rifle if you expect to learn its likes and dislikes. A fantastic tool for performing this function is on www.gunhive.com. In addition to being an excellent online firearms community, Gunhive.com has a remarkable feature in which you can catalog your firearms and keep track of each specific barrel for those firearms. 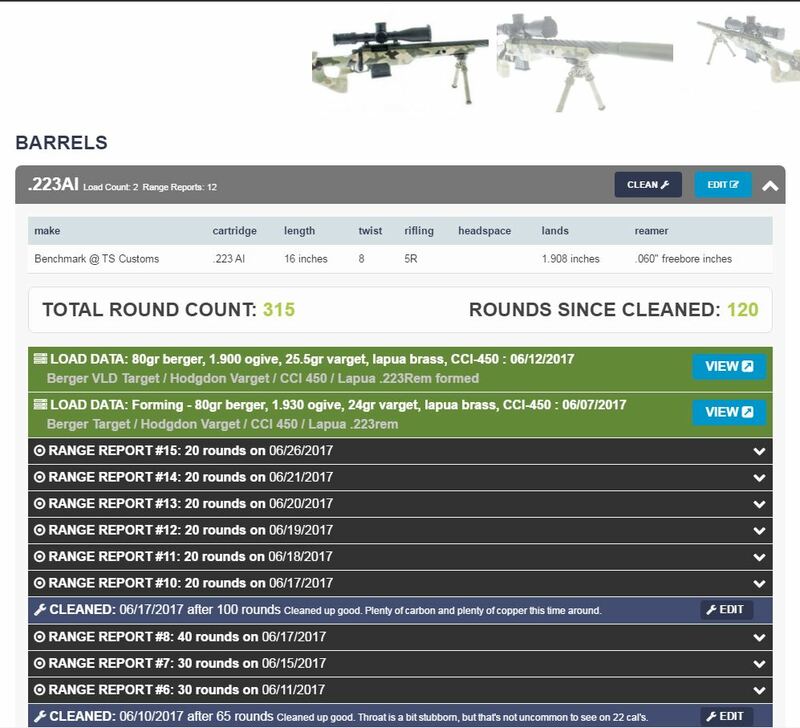 This allows you to track exact round counts on your action as well as each individual barrel. You can enter notes each time you clean as well as submit range reports when you go shoot. Click here to have a look at the log on my .223AI/300BLK switch barrel rifle from TS Customs. Data logging is a quintessential skill of an advanced rifleman. Discuss this article on the Gunhive.com Forums!